Fatigue is one of the most frequently reported symptoms of menopause, affecting as many as 80% of women. Menopausal fatigue is primarily caused by hormonal fluctuations. Estrogen and progesterone are responsible for making the body feel sleepy and maintain proper rest. Subsequently, when these hormone levels decrease during menopause, women often experience difficulty falling asleep. Fatigue can also be a result of lifestyle factors. 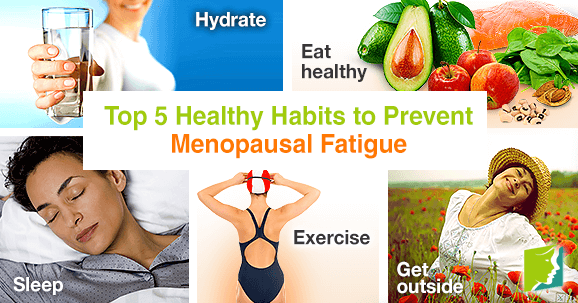 Keep reading to learn about some healthy habits to prevent menopausal fatigue. Dehydration is one of the main causes of fatigue, so it is important to stay hydrated. Drinking the equivalent of eight glasses of water throughout the day helps boost energy levels and reduce other menopausal symptoms, like headaches. An easy way to tell if you are properly hydrated is by the color of your urine - it should be a pale yellow. Anything darker than this indicates dehydration. Try to avoid excessive alcohol and caffeine consumption, as these substances significantly dehydrate the body. Maintaining a healthy, balanced diet is essential to preventing fatigue. Try to include plenty of protein, fruits, vegetables, complex carbohydrates, and good, polyunsaturated fats into your diet. It is recommended to eat three balanced meals a day, in addition to small, healthy snacks every three to four hours to keep blood sugar levels balanced. Energy-boosting foods include almonds, beans, salmon, avocados, apples, and spinach. Getting adequate sleep is crucial to feeling good and maintaining high energy levels throughout the day. The average adult needs around eight hours of sleep every night. Taking a warm bath, reading, and meditating before bed are all useful practices to perform before attempting sleep. Although it may seem counterproductive to exercise when feeling fatigued, it can actually help in the long run. Studies have proven that regular exercise can increase energy levels, improve mood and bodily functions. The general recommendation is to get around 30 minutes of aerobic exercise a day, or at least three times a week. Yoga, biking, walking, and swimming are all excellent low-impact workouts that can help reduce stress and prevent fatigue. Sunlight and vitamin D stimulate the nervous system and provide an energizing boost. When you are feeling fatigued and cooped up, try taking a brisk walk outside and get some fresh air. Menopausal fatigue is a bothersome symptom that can impact all areas of daily life. It is primarily caused by hormone fluctuations. Fatigue can impact a woman's ability to carry out everyday activities. Fatigue is often accompanied by other inconvenient symptoms like headaches and moodiness. Some healthy habits that can help prevent fatigue include getting outside, eating healthy, and exercising regularly. Will Beans Help You Fight Fatigue? Fatigue affects many women during the menopausal period, and if you are one of them, then you have probably discovered its disruptive effects.